The master of drama genres, Eun-hee Kim, who had produced drama 'Sign', 'Signal', etc. unveils 'Kingdom' on January 25th through Netflix pursuing various genres and platforms with director Seong-hun Kim. 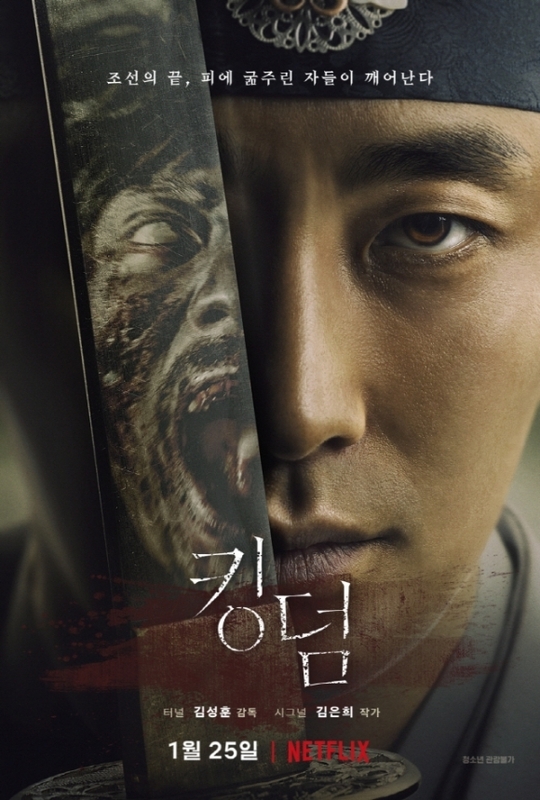 Comprising six episodes, 'Kingdom' is a historical drama that added the zombie genre, which goes all over the world. The main actors are Ji-hoon Ju, who plays the crown prince Chang Lee, Du-na Bae, who plays the doctor’s apprentice Seo-bi, and Seung-ryong Ryu, who plays the Joseon’s Prime Minister Hak-ju Jo. Eun-hee Kim, who produced the first Korean Netflix Original content 'Kingdom' in 2019, was able to freely create drama through the Netflix platform. Through Netflix, a bloodcurdling motion poster of about 15 seconds could give tension to the viewers before the start of the drama, and 4K Dolby Atmos could raise the perfection of the drama. 'Kingdom' supports the subtitling of 27 languages and dubbing of 12 languages in 190 countries around the world. With the genre of zombie thriller, the drama is expected to promote the content of Korea to the world and enhance the position of Korean contents. Each and every episode of <Kingdom> was like a movie since the contents were solid and realistic. As well as the vivid expressiveness of zombies and corpses that are looked dark red and full of wounds and scars, the settings of the town where the lowest class of people were lived such as the mud splashed, decaying wooden pillars, and stinky streets were enough to make viewers to fall into the drama. With outstanding expressiveness, fast but smooth story development and the remarkable acting of the actors had made it impossible to relax for a moment from the beginning to the end of the drama. The first witness of the plague that turned people into zombies, the doctor’s apprentice Seo-bi(Du-na Bae) showed a strong woman who responds realistically and proactively even though she witnessed a terrible scene. The crown prince Chang Lee (Ji-hoon Ju) leaves the palace as a traitor, faces the devastating reality and is confused that he has to accept his father’s condition. However, I am looking forward to seeing how he will be developed for the confrontation with the Joseon’s Prime Minister Hak-ju Jo (Seung-ryong Ryu). The combination of Chang Lee (Ji-hoon Ju) and his bodyguard Mu Yeong(Sang-ho Kim) that comes out often seemed to loosen up our rigid body in front of the tense video by showing the jokes and humor. In addition, Seung-ryong Ryu, who was the master of comic acting so far, has added the depth to the drama by newly taking on the charismatic role of the Joseon’s Prime Minister Hak-ju Jo, who is a practical overlord. He successfully showed the character full of ambition, as he does not show any disruption in front of the king, who became a zombie. After the movie <Rampant>, <Kingdom>is the second ‘work that mixed the zombie genre and period historical drama set in Joseon Dynasty’ with more solid story, realistic outputs, and the outstanding performance of the actors. Through Netflix, it is expected to increase awareness about Korean contents and show what a high-quality drama is.